The inspiration for FATEFUL came from attending an exhibition of artifacts brought up from the Titanic wreckage site, which was beautifully done. Although the recovered treasures were amazing -- jewelry, playing cards, people's letters, sets of china without a single cracked late -- what really got to me were the recreated rooms. The exhibit featured rooms the exact size as those on the Titanic, decorated in precisely the same style, so you could walk down a corridor, peer into a third-class cabin or a first-class deck. What else could make you imagine more vividly that you were really there? And, of course, me being me, I quickly began thinking of supernatural twists on the tale -- and there you go. What was the most difficult aspect of writing Fateful? In this case, the most difficult part was also the most fun: Staying true to the real physical layout of the ship and the real timeline. 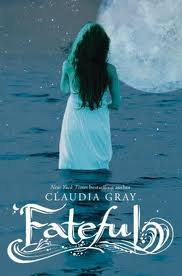 While the story of FATEFUL is supernatural, the setting is very real and I was determined to respect it. But jumping through those hoops was a delight, too, and gave me an excuse for tons of fun research. What are some of your favorite books that mash-up the supernatural and historical fiction? I know this isn't usually thought of as a book that features the supernatural, but the first one I thought of was CLAN OF THE CAVE BEAR by Jean Auel. The psychic powers of the Neanderthals are very normal in their world -- but supernatural in ours, and doesn't every paranormal novel embrace its supernatural qualities as real? One I read recently and greatly enjoyed was THE PHYSICK BOOK OF DELIVERANCE DANE, which actually manages to tell a fresh story about the Salem Witch Trials, which I thought was impossible. And of course, Anne Rice's Vampire Chronicles are forever going to be classics of historical paranormal fiction. Why do you think The Titanic is such a great setting for romantic stories? It's beautiful and it's doomed. I don't know what it says about people that those two elements together almost always feel romantic, but they do, don't they? What's the best feedback you're gotten with regards to your books? The best feedback is when someone says my stories inspired her to write her own. There's really no higher praise than that. Right now I'm writing the first book of a YA trilogy, which is both paranormal (focusing on witchcraft) and thriller. The tentative title is SPELLCASTER: THE FIRE. It's a story that's very dear to me, and I can't wait to hibernate with it over the next month or so.